The Physician Assistant profession is one of the fastest growing today. The Salus Physician Assistant (PA) program is based on the University’s legacy of excellence in clinical education. Our competitive, full-time, 25-month PA program prepares graduates to join one of the fastest-growing professions in the country and become integral members of today’s healthcare delivery team. Upon successful completion of the program, students receive a Master of Medical Science degree (MMS). The Salus University PA program is patient-centered with a primary care philosophy and holistic approach, so our students appreciate the need to not only care for the patient, but also about the patient. Our outstanding faculty is accessible and committed to the personal and professional development of our students. Early and extensive clinical training plus innovative teaching through small group and case-based learning are integral to the program. The second year is dedicated entirely to clinical rotations that provide direct patient care experiences in primary and specialty care disciplines. Contact us at 800.824.6262 or admissions@salus.edu to explore the opportunities awaiting you at Salus University. 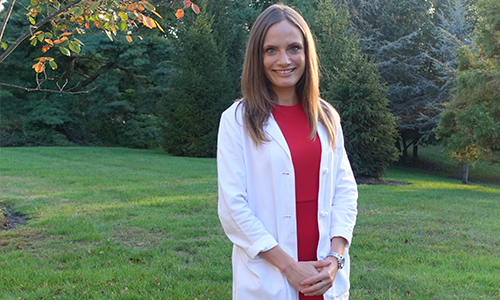 Jennifer M. Heibel, MMS ’15, PA-C, graduated with high honors from the University’s Physician Assistant Studies program and has already made remarkable progress in creating a career of meaning.